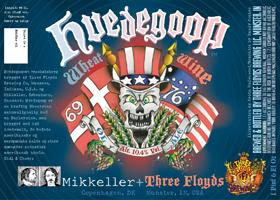 Indiana's Three Floyds Brewing Co. combined forces a couple of years back with Mikkeller of Denmark to brew Hvedegoop Wheat Wine, a 10.4 percent alcohol by volume brute of a beer. Three Floyds got its start in 1996, Mikkeller in 2006. Both have built a following among beer enthusiasts. Hvedegoop Wheat Wine pours with a slightly cloudy amber brown color and a thin, but persistent tan head. The nose has a slightly woody character with hints of citrus. The flavor has a caramel base with some hints of fruitiness that is dulled out in mid-palate by a ton of bitterness from Apollo and Bravo hops. A big collaboration.